Try to solve the lab problem in 10 minutes or less. 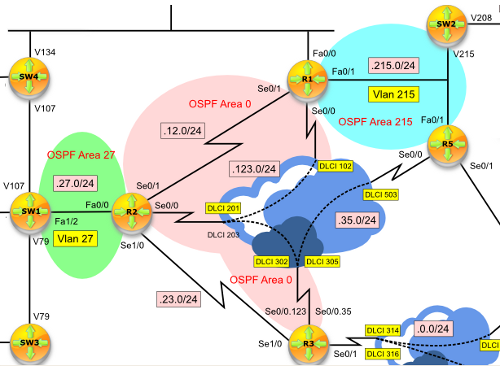 Change OSPF configuration of R1′s, R2′s Ser0/0 interfaces, and R3′s Ser0/0.123 sub-interface you have done in the previous lab such that the Frame-Relay network does not need DR/BDR election. R1 should see IP address of 172.16.123.2 as the next-hop address for subnets advertised by R3 when using S0/0 interface. R3 should see IP address of 172.16.123.2 as the next-hop address for subnets advertised by R1. On R3 do NOT use ‘ip ospf network‘ command to accomplish full adjacency with R2. Remove all redundant OSPF/Frame-Relay commands configured in the previous lab (problem 5). What other OSPF mode could you use in NBMA hub-and-spoke topology instead of using the default one? Why? What type of destination address is used in this lab as far as OSPF communication is concerned? What Frame-Relay command is NOT required for OSPF mode used in this lab? What are the default timers (hello/dead) while using OSPF mode you have configured in this lab? What is compatible mode with OSPF mode used in this lab? In case of OSPF mode used in this lab, what does LSDB show as far as the following are concerned (assuming default ospf mode): link connected to, link id, link data? 1. Would you be interested in receiving answers to the TEN MINUTE LABS? 2. If 'yes' to the first question: what format of the answers would you be interested in?